I have a gorgeous book to share with y'all today. It features photos of beautiful family quilts and devotions for each. The devotions in My Mother’s Quilts are inspired by these family heirloom quilts, some more than 100 years old. With humor and sincerity, Ramona Richards shares her memories and lessons learned from the quilters whose legacies live on in their work. Rich, personal, sometimes heartbreaking, often funny, each reading provides a lesson and encouragement from the faithful women who crafted the quilts. Together, these devotions depict the enduring legacy of faith, family, and beloved traditions. Book includes full color photographs of each of the 30 quilts! Ramona Richards is an award-winning editor, speaker, author of nine books, and a frequent contributor to devotional collections. An avid live music fan, Ramona loves Nashville, which she’s called home since she was ten. Sensing her mother was near the end of her life, Ramona documented her mother’s stories and lessons behind each family quilt. These stories form the devotions in My Mother’s Quilts. Find out more about Ramona and her books by visiting her online at www.ramonarichards.com. Order your own copy of this beautiful book of devotions here. (They have the best price online) Wouldn't this book make a wonderful Christmas present for a special Mom, Grandmother or friend in your life? 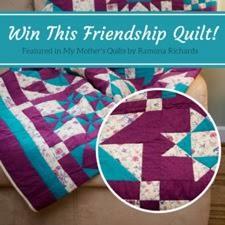 Win one of the quilts featured in #MyMothersQuilts by Ramona Richards. Also up for grabs: loads of other prizes including quilting hand warmers, coloring books, and 25 signed copies of Ramona’s book. Winners will be emailed after the contest ends on June 30, 2016. I would love for my readers to win some of these prizes, so make sure you take a minute to enter! Just click the link above and visit the official site to enter. Good luck! what a unique book idea, it sounds like an interesting one to peruse. I do love unique old quilts.